Step 5 is repeated in Step 8 on the opposite side. From this position (in the small image, left of Step 4), inhale slowly and bring the weight of your body to your left knee (shown in larger image left). Support your toes on your left foot as shown. Your right knee is bent and your right foot is stable on the earth. If you can bring your left heel out and down as shown, try that. But if that is too difficult, just be comfortable with your left foot until you have loosened up all the muscles first. There is no need to rush. You'll get there with practice. Visualize yourself doing this posture before you try to do it. That always helps! If the above is just impossible, you can do this one instead. This is much easier for beginners (just start with the right knee up so the instructions don't become confusing!). If you continue with the more advanced position that Eugenia shows above, lift your arms up with your elbows loose. Your right knee is still bent. Put your weight on the ball of your left knee and keep your right foot grounded, too. Feel the stretch in your entire body, especially your spine and your hips as you stretch. This will be repeated on the opposite side in Step #8. Step 6 is repeated again with Step 10 with a slight variation. Exhale quickly as you bend both knees and move your body down into what is similar to The Child's Pose (shown below), but here with a slight variation because you are supporting your feet by standing on your toes. Bring your forehead as close to the ground as possible and rest it on your folded hands. Think about how the Moon rests and hides every month. 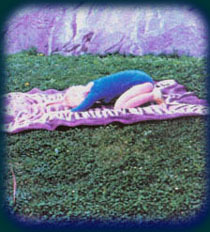 If this is too difficult, just relax your feet in the Child's Pose (as Eugenia shows below). Exhale as you get ready for the next Step #7 of The Moon Salutation. This position will be repeated in Step #10 with a slight variation in the way you move your head.